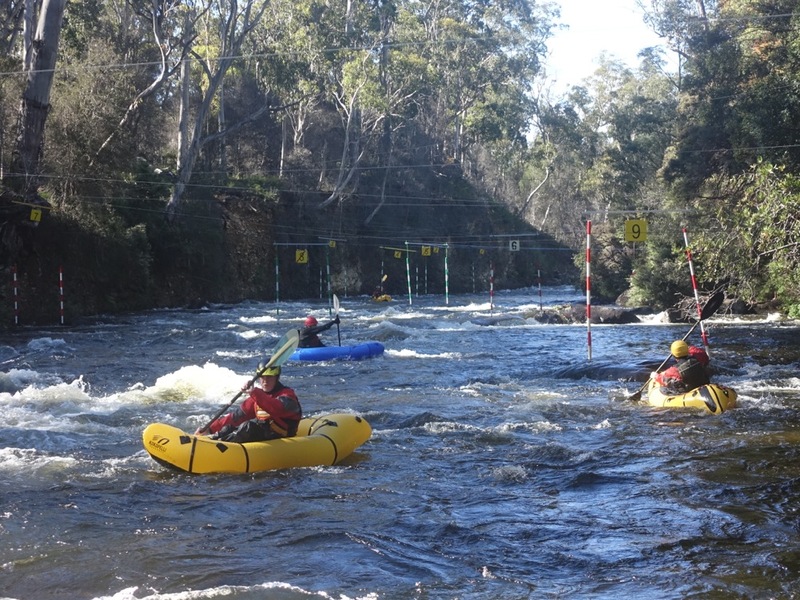 The course will be run by Paddle Australia Advanced Whitewater Instructors Dan Hall and Mark Oates but may also include additional instructors. It is ideally suited to those who currently paddle grade 2 rivers as well as those who are aspiring to learn to paddle grade 3 safely & competently. If you are unsure as to whether this is the right level of course for you please refer to the information click here. The focus of this course is on developing safety and technical knowledge specific to packrafts being used on grade 2+ whitewater. There will number of in-water practical components and all participants should be prepared for sessions involving capsizes and rescues plus swimming and wading in moving water (wetsuits are highly recommended or drysuits if available). Starting Time & Venue: Saturday 3rd November – Meet at 9.00 am for a 9:30 am official start. The starting venue is the Day Use Area, adjacent to the slalom site, at the Mersey White Water Regional Reserve (where there are toilet facilities, a shelter, fire pits and tables and you can overlook the slalom course). This is located between Lake Parangana and Lake Rowallan on the Mersey Forest Road – on the left 1km after crossing the Arm River and it is where the road goes back to bitumen for a short distance. Saturday night accommodation: This involves camping at the Berlin Wall campsite 850m from the day use and slalom area. It is a 3-minute drive or a 10-minute walk between the two venues. Note that there are no toilets at the campsite so participants are encouraged to take the 10-minute walk to the day use area to access the toilets there. Participants will need to bring their own tent, camping gear and full sleeping and cooking kit. Regarding stoves, for those flying in from interstate, Mark Oates (if notified) can arrange Trangia stoves and fuel for anyone who requires them. Participants need to bring ALL food for the duration of the course as there are no shops or services at all nearby. Note that there is almost no phone coverage after you leave Mole Creek and definitely none at either the paddling or camping venues. To find the Berlin Wall campsite from the Mersey White Water Day Use / Slalom area, travel 600m further along the Mersey Forest Road then turn left down a dirt track and follow this for 250m to a cleared area beside the river. 2WD vehicles are fine on this track. Course Conclusion: The course will conclude on the Sunday afternoon at about 3:30pm. It is not recommended that interstate paddlers book return flights on the Sunday prior to 6:30pm however participants may leave the course early if they need to.